Our Fastest Growing Public University in the State campaign has gotten some great media coverage and marketing mileage in April. 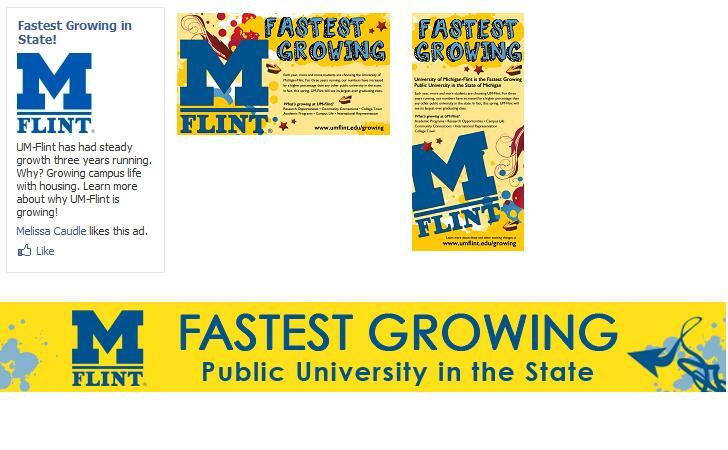 Many print and social media buys highlighted a variety of reasons why UM-Flint is growing. This campaign has allowed us to be very strategic with messaging, ad placement, and tracking traffic to the Growing landing page. With the help of Google Analytics, we can now truly get a sense of what marketing ideas work and ones that may need some improvement with message or ad placements. The Facebook ad analytics show that our UM-Flint fan page has gained over 400 new fans since the Growing campaign started. Furthermore, Google Analytics on the Growing landing page indicate that the Facebook ad controlled 48% of the total unique visitors to the site. Analytics also provide a reality check on ad adjustments that need to be made. For example, we found that a Facebook ad highlighting housing as an area of UM-Flint’s growth was not properly directing viewers to the information they wanted, which in turn created a very high bounce rate on the Growing page. When viewers clicked on the ad, it would take them to the Growing landing page that does not have any housing information in the opening paragraph, but talks about housing at the bottom of the page within the “campus life” tab – how convenient! To solve the problem, we redirected the Facebook ad link to actual housing information. Hopefully, next month’s report will have a lower bounce rate.